There is a belief we all have a control freak inside of us, wanting to manage every single action a town makes, in order to build a solid town running itself like clockwork. 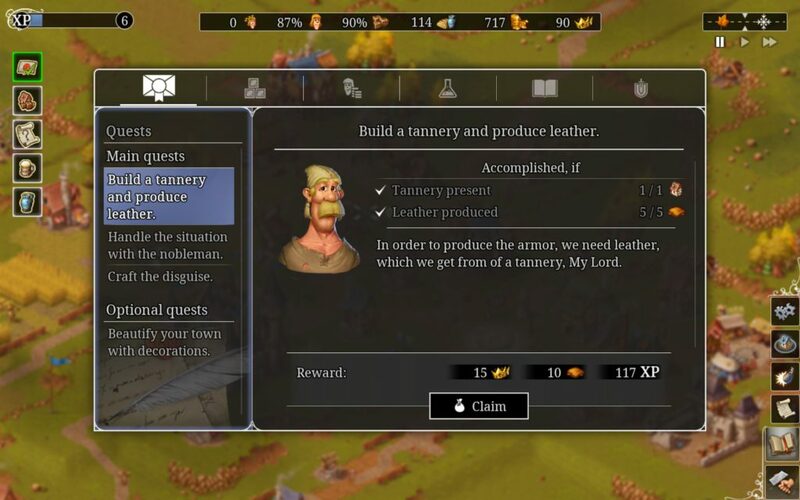 THQ Nordic’s acquired Handygames released Townsmen: A Kingdom Rebuilt, a remaster of their 2016 game ‘Townsmen’, offering gamers a new city building game in a fun and cartoonesque style to bring back memories of those games such as The Settlers or the Anno franchise. Surprisingly for this franchise, the game offers a nice little story made out of 6 mission-like tutorials. You are the governor of a town sent by the king to this remote location after an internal squabble. You are joined by an old lady who is the keeper of the keep along with a knight who firmly remains loyal through these trying times. This comes with a bunch of new responsibilities such as food, water, clothes and other things to keep the villages satisfied enough to work for you while you tax them to further your expansion. Of course there is a nobleman out for you who will make your life harder as you try to make do with the resources you have. You will be facing strikes as your workers are displeased but also weather conditions, bandits, disasters and the worst threat of all… basic economics. This tutorial is meant to get you prepared to run your own town in an endless game where some of the characters you meet in the story will return to offer advice and quests. As little story as there is, the game offers a fun little tale that actually makes the tutorial worth playing. The visuals are quite fun, really. Everything looks neat and has a lot of character as the medieval stones and wood buildings you’ll recognize. The whole setting is cartoony going from small houses to windmills to full complexes to fuel your supply of tools. It’s all quite simple and that’s the beauty of it. Water looks like water, wheat looks like wheat.The real graphical fun is in the difference your townspeople have as your town grows. You’ll see a fat baker moving from the windmill to his bakery or a few women run up to the marketplace. A hunter, a lumberjack and even regular townspeople moving from one building to the next giving this game a real vibrant feel as your efforts to increase the population are directly visible. There isn’t much diversity in the sound as everything plays on a loop. The music can get quite annoying while you’re playing for longer periods of time so it’s quite common it gets turned off. Voice-acting is made of a made-up language consisting out of grunts and exclamations which don’t always fit the context or feeling behind the message delivered. That being said, the music turned off allows you to listen to the sounds of your town. If you move around you will hear different sounds as the toolmaker is hammering his anvil or the baker is complaining he ran out of flour. You’ll hear your sheep bleat and your pigs squeal just as much as you’ll hear a cough if you’re so unfortunate to be hit by a plague. 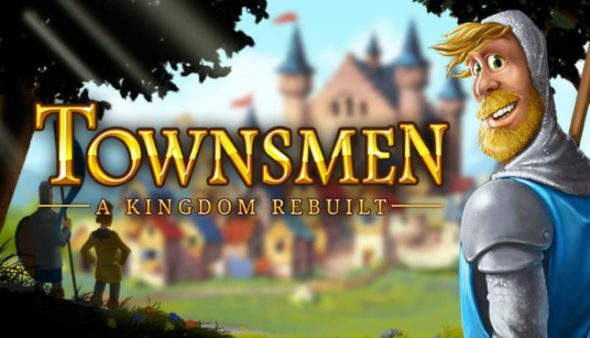 Townsmen: A Kingdom Rebuilt is a resource management/town building simulation game. It will be most accurate to describe the game to be strategic as the player is challenged to keep certain things as balanced as possible. It’s easy to say that every building is a decision and every decision can go fatally wrong. It is quite easy to fall into a trap of rapid expansion. It’s important to think of the long game as you build your next supply chain. Do you have enough firewatch towers? Are you close enough to your keep? Do you have enough people to transport supplies? Prevention is better than reaction in this game as one wrong move can potentially cost you your whole town. Ever had a plague in a town without infirmary? It’s nasty and it goes quickly. Just saying. A downside in this game is the lack of a combat system. 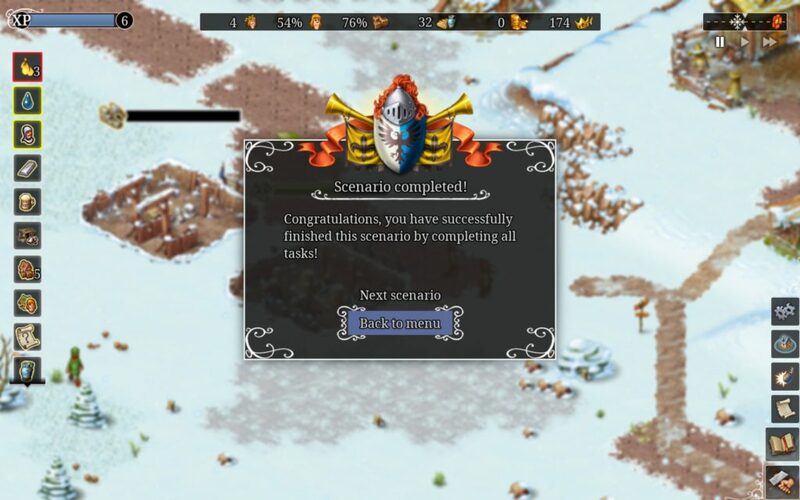 In order to defend your town from invaders, you only need to build some military structures and strategically place them around your town in order to have it all dealt with passively. This is the only way. There is no real benefit to try and obtain a surplus of military supplies. Keeping all of the above in mind, once you found a balance in your building and you have a solid supply chain going you can sit back, relax and watch your treasury grow to ridiculous amounts, responding to minor natural disasters with a simple click of a button. That’s the moment you might want to try a different map with harsher conditions in order to see if you’re able to make a town thrive in a permanent winter or even a swampland, though even there, once you found a balance will make the town run itself. Another fun little note, the game has a leveling system which allows you to research permanent upgrades passively boosting your gameplay and facilitating further expansion. 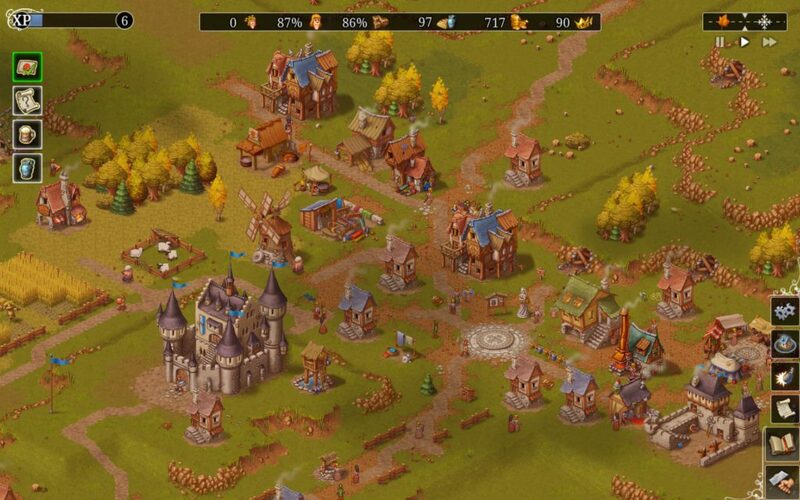 Townsmen: A Kingdom Rebuilt is a fun game which will keep you entertained for several hours. It stays true to its genre where you can expand a town to the level of ridiculously huge, pushing yourself to find the proper economical balance and defending what’s yours against all sorts of invaders and disasters. While not a pioneer or revelation to the city building genre, it is a nice pastime for those who enjoy these type of games. "What the-..?" said the hero to the finger pointing over his head.